Lunar eclipse photographed through a telescope from Woodslawn Farm on November 9, 2003. Photo by Dave & Stephanie Purington. I wrote these haiku and perhaps 20 more in November 2003, when Dave, Stephanie, Katy, and Elizabeth gave me running commentary on the event, which I did occasionally see for myself through a carefully-positioned-and-held mirror. From what I remember, a total lunar eclipse is definitely worth staying up late for. Probably even more so when it's a supermoon. 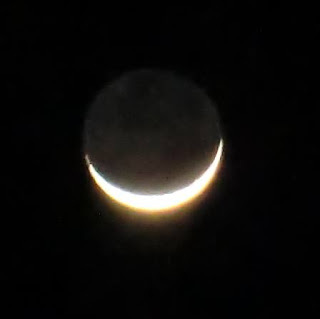 A bright sliver of the moon (not an eclipse) seen from Stuart, FL in, 2015. Photo by Nancy Purington. September 27, 2015 lunar eclipse photo taken from Rutland, MA by Jim: "About 11 pm, a few minutes after the max. Perfect viewing conditions."